I just received a package today from Sunrise Greetings, a card company in Bloomington, Indiana. 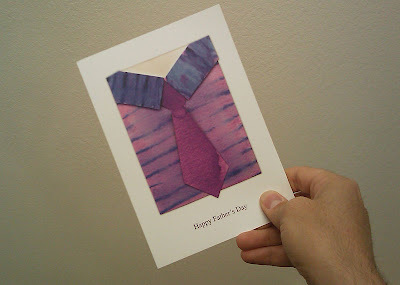 I do some card design for them every so often, and today's box had samples of a Father's Day card I illustrated for them. It's watercolor on watercolor stock, collaged together to form a shirt and tie (which I hope is obvious). If you want to order some for yourself call Sunrise Greetings at 800 457 4045 and ask for the new Father's Day cards by Isaac Brynjegard-Bialik (item # RFDGC.94484.1)! Noah's Ark Papercut:"The Waters Increased"